Paris-Nice was more like a prizefight this year, and Discovery Channel's Alberto Contador was the last man standing. Davide Rebellin had taken every punch that Discovery Channel threw this week, but every day, he found himself with fewer supporting teammates, and on Saturday, survived by reeling in Contador with less than 2 kilometers to ride. Sunday's Stage 7 was reminiscent of Discovery Channel's Lance Armstrong days: Everybody knew what they were going to do, and they went out and executed to perfection. With Rebellin down to 3 teammates in the race, Discovery put Sergio Paulinho and Stijn Devolder in a break with just 5 kilometers ridden. Thomas Voeckler was also in that break, nailing down the overall climber's jersey, and leading the field over the day's first two climbs. Just behind him over the Col de la Porte, setting a torrid pace, were the Discos, with Danielson, Leipheimer and Popovych leading Contador, and Caisse d'Epargne's survivors and Rebellin just behind. On the day's third climb, La Turbie, Discovery whittled the field to less than 50 riders, reeling in Voeckler, and setting up a Rebellin-Contador showdown on the day's final climb, the Col d'Eze. When Contador launched, no one could match him, and he quickly opened up 30 seconds on Rebellin. But Rebellin wasn't giving in, taking help where he could find it, and driving the pace himself where he couldn't. With less than 10 kilometers to ride, Contador had 25 seconds in hand, and Rebellin, working with Frank Schleck of CSC, closed the gap to about 17 seconds. If Contador took the stage, bonus time would guarantee a win, so with about 2 kilometers to ride, Rebellin soloed out of his little group riding all-out for the victory. But Contador wasn't going to be caught today, and in the end, he finished 19 seconds ahead of Caisse d'Epargne's David Lopez and Joaquim Rodriguez, who overtook an exhausted Rebellin before the line. Rebellin finished 8th on the day to take 2nd overall, but all eyes were on the 24-year-old Contador. 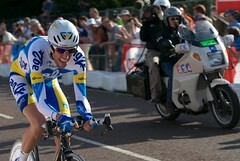 Contador also won the race's young riders competition. Voeckler takes the climbers jersey, Franco Pellizotti of Liquigas the points jersey, and Caisse d'Epargne the team competition. Given the current state of ASO-UCI relations, it's no surprise there was no ceremony recognizing Contador as the first leader of this year's ProTour, but so he is. Some of the most literate and passionate weblogging on the Tour has come from “Crazy Jane,” who often contributes to Daily Peloton's Tour coverage (anywhere you see “Updated and Delicieux”), and whose weblog, Le Tour Delicieux, remains in my blogroll, despite being silent for two years (2! years! ), in the hope that she'll turn her considerable talents back to the Tour. She's also (along with Velogal and Marianne's Twenty-One Stages, others?) one of the few women writing about the Tour. Jane is in Paris for the Tour finale, and has posted a number of terrific pictures of riders before yesterday's La Creusot TT, including Hincapie (above), Viatcheslav Ekimov, Gilberto Simoni, Thomas Voeckler, Jens Voigt, Chris Horner, Axel Merckx (times two), Vladimir Karpets, Stefano Garzelli, Stuart O'Grady, and Didi “Tour devil” Senft, plus some fan shots. Today's a legbreaker; 5 major climbs, which are likely the reason the peloton was somewhat passive yesterday. First up is the Col du Tourmalet, one of the Tour's legendary climbs. CSC's Giovanni Lombardi withdrew low on the climb of the Tourmalet, and Iban Mayo sits almost 3 minutes behind the main field, gesturing angrily at the race motorcycle, hovering nearby in case he drops out. AG2R and Phonak are leading the peloton, with Merckx, Perdiguero, and Robbie Hunter (!) leading Landis. Saunier Duval's David de la Fuente, Gerolsteiner's Fabian Wegmann, Rabobank's Juan Antonio Flecha, and Euskaltel's Iker Camano are 5:11 ahead of the field. Wegmann apparently wasn't joking earlier in the Tour when he went out grabbing king of the mountains points, and he's doing most of the work in the leading quartet today. Rubiera is off the back for Discovery, Thor Hushovd, Samuel Dumoulin. Gilberto Simoni is off the back. Boonen, Brard and Voeckler have reportedly also fallen off the pace. Chris Horner is reportedly dropped, and Paolo Savoldelli (!). Some of these guys will chase back on, but they've got 4 more 1st-Category climbs to go. Sandy Casar is off the back. Zabriskie is maybe a minute back, and three Discovery riders are sitting together at the back of the leading group. Egoi Martinez finally falls off the back, and Ekimov and Noval work back up into the field. AG2R still has 6 riders in the front, doing their yellow jersey proud. As the leading quartet approach the summit, they all are climbing out of the saddle, and De la Fuente marks Wegmann. Wegmann keeps the pace low, and finally, De la Fuente launches an attack. Wegmann sits on his wheel, looking for the summit points and cash prize, but De la Fuente has the inside line and gets the prize. As the main chase group approaches the summit, Rasmussen attacks, joined by Voeckler, and Voeckler outscraps the skinny Dane for 5th place points. Yellow Jersey Dessel takes 7th, good for 8 points. There was a split in the front group, but they're back together now, approaching the base of the Col d'Aspin, our next climb. The peloton is growing on the descent, and Voeckler attacked over the Tourmalet and has more than a minute on the field, sitting about 4 minutes behind Camano, Wegmann, De la Fuente, and Flecha. Col d'Aspin is not splitting the field like the Tourmalet. The peloton is still 70-80 strong. Casar is off the back, and Benjamin Noval, among a few others. Voeckler is 2:20 behind the leaders, and more than 3 minutes ahead of the field. Zabel and Garate have fallen out of the field; Rinero, David Millar, Philippe Gilbert, Chechu Rubiera are also dropped. Voeckler is closing fast on the leaders. Wegmann launches with more than 300 meters to the summit, and De la Fuente wasn't ready to contest it, so Wegmann takes the 18 points over the top, ahead of De la Fuente, Flecha and Camano. Voeckler 5th at 1:30, and Michael Boogerd leads Rasmussen up to the line for 6th place points at 4:05. Next, the Col de Peyresourde. Voeckler continues to close, 35 seconds to the leaders, while the peloton is now 3:49 back as the leading quartet pass the "10 kilometers to the summit" sign. Camano is falling off the lead group as Voeckler approaches from behind. They're about 15 seconds back. Flecha is laboring hard, and he's dropped. Voeckler goes by Camano. Egoi Martinez and Stefano Garzelli have fallen off the field. Klöden is right up front, with Michael Rogers on his left shoulder. Pereiro is off the back for, and Popovych is "stretching the elastic" at the back of the pack. Wegmann and De la Fuente are riding alone for the summit, gaining time on Voeckler and Flecha. Flecha's 1:00 back, Voeckler's at 1:39. The sweat is dripping out of his helmet. Leaders are 1k to the top; let's see how the games go. De la Fuente is trying to get Wegmann to come around. They're side-by-side. De la Fuente hits the afterburners from pretty far out, and Wegmann couldn't match him. De la Fuente may be cramping, but he's the new leader of the King of the Mountains competition, for now at least. Camano is caught by the main field. Flecha is 3rd to the summit at 2:10, but Voeckler is caught, and Rasmussen gets 4th over the top at 3:00. Popovych is 40 meters off the back, and looking for the team car. I'm going to start a new post for the Portillon and the Pla de Beret. So who are the team leaders? Today was supposed to be the day when we found out the GC men for the teams with podium dreams. A few things have definitely cleared up. There are a few guys who stepped up and showed they're the leaders of their teams, with hopes for high overall places: Landis is the man for Phonak, as expected; Cadel Evans for Davitamon-Lotto, Denis Menchov for Rabobank, Vladimir Karpets for Caisse d'Epargne, Christophe Moreau at AG2R. All finished within about 2 minutes of the Ukraine Train today. CSC is back to one leader: Carlos Sastre. It was funny the first week of the Tour to read, within 24 hours, a US source touting Bobby Julich as the rider who would have to step up to fill Basso's shoes, Eurosport Germany referring to “new CSC leader Jens Voigt,” and to read that the team itself voted Sastre its captain. Sastre is the best rider of those three, and Julich's crash and Voigt's easy ride today reinforce that. A bunch of other things are way foggier than they were yesterday. Gerolsteiner claimed to have two co-captains, Totschnig and Leipheimer, coming into the Tour. After today, they're both 4+ minutes down, and Leipheimer may not be generating much power. They've got Marcus Fothen, who sits 5th, 1:50 back, and finished 12th in the 2005 Giro, but he's only 25 years old. He could compete for the young rider's jersey. T-Mobile opened a big old powerful Pandora's Box full of superstrong riders. Their slowest rider today finished 14 seconds faster than Britain's TT specialist David Millar. They've got the 4 potential leaders we all thought Discovery Channel might show: Honchar, Michael Rogers, Andreas Klöden, and Patrik Sinkewitz, and I could make a case for any of them. Chris Carmichael tips Klöden, and I could see that: he's German and he's been through this before. And what about Discovery Channel? Savoldelli has 20 seconds on George Hincapie, who had suggested the road would choose the team's leader through the first week and today's ITT. I've never seen Hincapie as crestfallen as on OLN's prime-time coverage; he really looked flattened. Popovych and Azevedo were even farther back today; I say Savoldelli's the horse to back. Marcello at VeloChimp.com agrees. There are also a number of team leaders who are really hard to take seriously now, even with mad climbing skills: Gilberto Simoni is 5:34 down, Thomas Voeckler 5:35, Iban Mayo sits 6:11 down, and Damiano Cunego is at 7:06. David Moncoutié? 12:15 down. Gerolsteiner's Fabian Wegmann joined 3 other riders on the attack over a late 4th Category climb and worked hard in the break to keep the cushion to the finish. Wegmann, Thomas Voeckler of Bouyges Telecom, Francisco Mancebo of AG2R, and Egoi Martinez of Discovery Channel went away just after the peloton reabsorbed Nicolas Inaudi of Cofidis, who had been on a solo break for 190 kilometers (almost 120 miles). Wegmann split the break in the last kilometer with a strong attack off Voeckler's wheel. Mancebo couldn't counter, and Voeckler couldn't muster enough speed to outkick Wegmann to the line. The field came in 12 seconds back, led in by Danilo Napolitano of Lampre. Wegmann took a time bonus at the finish that puts him in the overall race lead. He also holds the points jersey. Voeckler moves into the the climber's jersey and the combination jersey. No live coverage at CN.com or VeloNews for the Dauphiné, so you've got a choice between Cycling.TV's premium web stream, DailyPeloton's stage commentary, an open thread at PodiumCafe.com, or my “as it happens” report for more details on the stage. Top 10: 1) Wegmann, Gerolsteiner, in 5:06:36 2) Voeckler, Bouyges Telecom, same time 3) Martinez, Discovery Channel, same time 4) Mancebo, AG2R, at :02 5) Napolitano, Lampre, at :12 6) Sebastian Siedler, Gerolsteiner, same time 7) Chris Horner, Davitamon-Lotto, s.t. 8) José Rojas, Astaná-Würth, s.t. 9) Philippe Gilbert, FdJeux, s.t. 10) Mauro Da Dalto, Liquigas, s.t. GC (CORRECTION 1:30 p.m.): 1) Wegmann, Gerolsteiner, in 5:11:23 2) Voeckler, Bouyges Telecom, at :05 3) Dave Zabriskie, CSC, at :05 4) Egoi Martinez, Discovery Channel, at :07 5) George Hincapie, Discovery Channel, at :07 6) Mancebo, AG2R, at :09 7) Thor Hushovd, Credit Agricole, at :11 8) Stuart O'Grady, CSC, at :11 9) Sebastian Lang, Gerolsteiner, at :12 10) Joost Posthuma, Rabobank, at :13 Valverde, Landis, Moreau, and Vinokourov are all within 15 seconds of the race lead. Of course, nearly the whole field is within 1 minute of the race lead. One of the best daily wrap-ups of Tour action on the web is dailypeloton.com's Jambon Report, where Locutus picks out his Golden Hams and Ham-Gazers for each day. Lorenzo Bernucci (Fassa Bortolo). ... His teammate, former Yellow Jersey wearer Fabian Cancellara, went down in the crash, but immediately popped up and saw the gap Bernucci had. He got onto his radio microphone and screamed, "Vai! Vai! Vai Lorenzo!," and man did Lorenzo vai (by the way, I think that's Italian for, "Lorenzo! The lycra on your buttocks, it is on fire! Ride quickly and perhaps you shall extinguish it!") Bernucci had put himself in position to win, and when luck fell his way he drove it home to the finish to claim his first professional victory. This was an outstanding victory for Bernucci and his Petacchi-less Fassa team, a product of hard work, talent, and taking the risks necessary to win. More good stuff on Vinokourov, Hushovd, Voeckler, and Zabriskie. Here's Watson's Stage 2 Report from ThePaceline.com (free registration required). CyclingNews.com has a huge photo gallery today, with more than 90 photos in all. If you've got a favorite rider, he's likely in there. 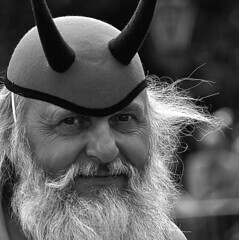 Also, the first devil-sighting (what?) of the year. We have the 2005 Tour's first doomed break! Out in front Sylvain Calzati, Thomas Voeckler, Laszlo Bodrogi, and David Canada flew their team flags, at one point around 3:30 up on the field. Voeckler is the rider who got into an opportunistic break in last year's Tour (while the French national champion, no less) and wore the yellow jersey for 10 days, fighting and scratching to hold on to it as the race headed into the Alps. He then held the young rider's white jersey until the final TT, when Vladimir Karpets took over the lead in that competition. Lance Armstrong is wearing the green jersey today, since David Zabriskie can only wear one jersey at a time. Whoever wins the stage today will become the first real green jersey. It's a very easy course profile today, and only 181 kilometers, or around 110 miles. Everybody and his brother is predicting McEwen today; I'm going to be contrarian, and go with Quick Step's Tom Boonen. McEwen will be adjusting to a new lead-out man, American Fast Freddie Rodriguez. Other sprinters to watch: Baden Cooke and Thor Hushovd. There's a 4th category climb coming up, and if the break can survive to the top, one of its riders will wear the mountain jersey for at least tonight. The breakaway has survived, and will contest the polka-dot jersey; David Cañada launched an attack and gapped the group, and now Voeckler slingshots off of Calzati, bridges up to Cañada, and sprints away from him with 50-75 meters to ride. At the top, he's over first, so he'll wear his third different Tour jersey (yellow, white, polka-dot). Bodrogi falls back into the field, leaving three leaders to catch. Erik Dekker tries a late attack, but FdJ puts Carlos da Cruz on his back wheel, and he can't make it stick. With 6 kms to ride, the breakaway is absorbed. It's a sprint finish with some turns; could get dicey. In the last 2 kms, a couple of opportunistic attacks from Beneteau and Zaballa, but for nothing. It's the big boys for the sprints: McEwen may have jumped a little early, and Tom Boonen gets his back wheel and comes around him for the win. Thor Hushovd is right there. Armstrong by more than a minute; Klöden up to 2nd overall, but Basso holds 3rd. Voeckler loses white jersey to Vladimir Karpets. More later. Juan Miguel Mercado of Quick Step launched from a 6-man breakaway with a few kilometers to go, then sprinted by Vincente Garcia-Acosta for the stage win. Garcia-Acosta was second, while Cofidis rider Dmitry Fofonov led in 4 chasers. Sandy Casar made an attack late in the stage to try to move up in the white jersey, but Illes Balear-Banesto shut it down in support of Vladimir Karpets. An incredible field sprint today goes to Credit Agricole's Thor Hushovd, then green jersey Robbie McEwen. 5) Marc Lotz (Rabobank) s.t. 6) Juan Antonio Flecha (Fassa Bortolo) s.t. 9) Danilo Hondo (Gerolsteiner) s.t. 10) Stuart O'Grady (Cofidis) s.t. McEwen hasn't quite locked up the maillot vert, but only Hushovd moved any closer. The only points still available are on Sunday at 2 intermediate sprints and the finish line. Complete results are available over at RoadCycling.com. An incredible finish, as the hard climbs eliminated all but the contenders, and they had to shoot it out on the run-in to the finish. Landis was the 1st to go, but the T-Mobiles saw a chance to gain on Basso, and pounced with 1 km to go. At 500 meters, Klöden sprinted for the line, but Armstrong was too strong, as he has been for the entire field, and took him at the line. Thomas Voeckler, at 21:12 back, has 45 seconds on Vladimir Karpets in the white jersey competition. Based on the strong finish by Azevedo, Landis, and Armstrong, US Postal is now 2nd in the team competition to T-Mobile, who took over the lead from CSC, now 3rd, after yesterday's time trial. Cyclingnews.com offers a look at the bike Thomas Voeckler rode for 10 days in the yellow jersey. It's a carbon-fiber compact-frame Time model, with an interesting mix of Time, Campy, Mavic and Stronglight components, and with some of his componentry painted red, white and blue to celebrate his French national championship, won just before the Tour. Brioches La Boulangère is one of the teams riding Michelins, and they have used the new tubeless clinchers on the mountain stages. T-Mobile tried to save Jan Ullrich's Tour on Tuesday, shredding the peloton, then launching Ullrich on an attack with nearly 40 miles to ride. Rather than rise to the bait, and ride one-on-one with Ullrich, Armstrong stayed in a select group with teammates and other elite riders, gradually reeled in Ullrich, Richard Virenque, Michael Rasmussen, and other riders who had gotten up the road, then matched the tempo set by Ullrich and T-Mobile teammate Andreas Klöden on the final climb before finally riding away from the pair, along with CSC's Ivan Basso, in the last 300 meters of the day. "Johan Bruyneel (the US Postal team boss) said to me this morning he expected Jan to break," said Armstrong afterwards. "But it was harder than I expected - more aggressive. But it's great to be back in yellow today." Ullrich has clawed his way back into the Top 5 on the race, but hasn't put significant time into either CSC's Ivan Basso or Ullrich's teammate Andreas Klöden, and it looks like he will have to unseat one of them to move onto the podium. Thomas Voeckler was finally unseated from the race lead, a lead that seemed precarious when he took it but led to the 25-year-old becoming the toast of France. He can take comfort in the white jersey awarded to the best rider 25 or under, a competition he currently leads by 7:41 over fdjeux.com's Sandy Casar. Armstrong and Azevedo of Postal, Basso, Sastre, and Voigt for CSC, Kloden and Ullrich of T-Mobile, Rasmussen and Leipheimer of Rabobank, Richard Virenque of Quick Step. Sastre, Voigt, Azevedo, Rasmussen, and Virenque have fallen off the back. Down to Kloden, Ullrich, Basso, Armstrong, and Leipheimer. 500 meters to go; Leipheimer is off the back. The T-Mobile's are pushing the pace, now Basso has sprinted away, and Armstrong turns on full steam. 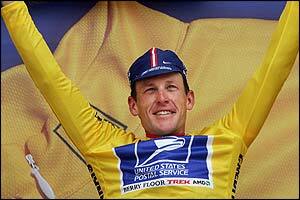 Basso can't hold him off; Armstrong has his 2nd stage win of the 2004 Tour. It's Armstrong's 20th career stage win. Voeckler finished down 9:29, so Armstrong will take the 61st yellow jersey of his career, and start last in tomorrow's individual time trial up l'Alpe d'Huez. Armstrong gains a little time on Ivan Basso based on the time bonus for the stage win. Stage 15 underway: Jan attacks! With nearly 40 miles to go, Jan Ullrich accelerated out of Lance Armstrong's group. He's caught and rode with Santos Gonzalez, who was on an attack, and former world champion Laurent Brochard of AG2R. Ullrich had more than a minute advantage at one point, but was captured with 27 kilometers/17 miles to ride. Richard Virenque and Michael Rasmussen led for much of the stage. Ullrich's attack never quite bridged up to them, but as Armstrong closed in on Rasmussen/Virenque, Levi Leipheimer jumped across the gap, tried to join with Rasmussen and Virenque, but Rasmussen couldn't hang. Leipheimer and Virenque tried to make a move, but the higher tempo of Armstrong's group dropped some riders off the back, including Brochard and CSC's Jens Voigt and Postal's Floyd Landis and Jose-Luis Rubiera. Now Leipheimer and Virenque have been recaptured, and all the contenders are together: Armstrong with Azevedo, Ullrich and Kloden for T-Mobile, Basso and Sastre for CSC, Virenque of Quick Step, and Leipheimer of Rabobank. On the day's last descent, Michael Rasmussen of Rabobank and CSC's Jens Voigt have rejoined the elite group. Sabaliuskas of Saeco has climbed back up to join the leaders, so there are 11 riders in the elite group. Armstrong is "yellow jersey on the road," since he leads Voeckler by more than the 22 seconds between them: The gap to the main peloton is 7 minutes+. Stuart O'Grady has picked up 6 green jersey points by taking the 2nd intermediate sprint of the day, ahead of Thor Hushovd and Laurent Brochard. Virenque has picked up 20+ points in the polka-dot jersey competition. Yellow jersey Thomas Voeckler's performance in the French national championships and in the 2004 Tour de France have earned him a place on France's squad for the 2004 Athens Olympics. Also on the squad will be Laurent Brochard, Sylvain Chavanel, Christophe Moreau, and Richard Virenque. French technical director Patrick Cluzaud recognized Jérôme Pineau as the last man out in the selection process, edged by Chavanel, and named David Moncoutié and Sandy Casar as two others who "are going well." Moreau and Brochard will race the time trial for France. Lance Armstrong was clearly the strongest man in the race today, as he powered through one of the Tour's hardest stages and took the win. It's Armstrong's 19th career stage win. Looks like the prognosticators were right about this being a 2-man race, but they had the wrong 2nd man: Ivan Basso again rode to the top of the mountain right alongside the 5-time winner. Iban Mayo came in 115th at 37:40. His race for the GC is completely over. We'll see if he can recover enough to compete for a mountain stage. Armstrong and Basso are head to head. Now Azevedo will rest for another day. We've just passed the first naked fan of the day. Ullrich has dropped off the back of the elite group, with Leipheimer. Totschnig is only about 10-15 seconds behind Armstrong/Basso. Right now, it's Armstrong, Basso, then Totschnig, then Mancebo, then Klöden, then Ullrich. Leipheimer is 2:15 behind the leaders. Voeckler has fallen 4:10 down to Armstrong and Basso. He's not going to keep the yellow jersey tonight. Update: Shows what I know! Off the back are Simoni, Scarponi, Sastre, Moreau, Voeckler, Virenque, Mercado, and others. Gerolsteiner's Fabian Wegmann has also abandoned today. Leading the race over the first 4 climbs has been a break of 3, including Brioches la Boulangere's Sylvain Chavanel, Jens Voigt from Team CSC, and Michael Rasmussen of Rabobank. They've been up by about 5 minutes, but now Chavanel has been caught by Armstrong's group, and the gap to Voigt and Rasmussen has fallen under 2 minutes. Iban Mayo is at least 10 minutes back on the stage, and clearly suffering on the Pyrenean climbs where he has made his reputation. He actually got off the bike (shades of Simoni), but was convinced to get back on, and continues. For now. Thomas Voeckler continues to ride above his head in an incredible show of courage, and of the power the yellow jersey sometimes has to elevate a rider. He's again yo-yoed off the lead group on the climbs, but fought back, and is riding with Armstrong. He's reportedly had stomach problems, as well. Jan Ullrich is still riding with Armstrong in the main field, but Heras is falling away from the leaders. He crashed earlier in the stage. The elite group, once down under 20, has grown, as the riders get ready to start up Plateau de Beille, the first beyond-category climb of the race. Richard Virenque's polka-dotted jersey has come under attack by Chavanel and Rasmussen, and Virenque has had to settle for 4th-place points over 5 climbs. Rasmussen now sits 2nd in the competition. Onto the Plateau de Beille, 2 Posties immediately fell off the pace, Landis and Hincapie. Armstrong still has Rubiera and Azevedo, and Voeckler has finally fallen off the elite group. "I knew that if I attacked on the last slight incline and managed to build a lead of 30sec on them I would manage to hold them off," said Moncoutie, who had tried several times early on to escape the clutches of the peloton. "It's my best ever win, and it definitely helped the fact that it was in my region. "Winning a stage on the Tour de France was one of my career ambitions, so you can imagine how I feel." "I'm feeling okay, but not much better," Voeckler said after the stage. "Today the team did well again helping me to defend the jersey, but I'm beginning to feel the effects of the past few days of racing. "I'm not looking forward to tomorrow (the climb to La Mongie) but who knows, maybe I'll feel better than I anticipate." Moncoutie takes Stage 11; what French drought? David Moncoutie found a winning break and rode away from it to take Thursday's Stage 11. Moncoutie's breakaway companions were next, with Fassa Bortolo's Juan Antonio Flecha 2nd and Euskaltel-Euskadi's Egoi Martinez 3rd. Thor Hushovd took the field sprint, ahead of Erik Zabel, Robbie McEwen, and Paolo Bettini. Armstrong again rode in with the sprinters in search of any time gap among the leaders on the uphill finish. It was the second consecutive stage win for a French rider, and the 2nd stage win of the Tour for Moncoutie's Cofidis team. Additionally, Thomas Voeckler of France is wearing the yellow jersey at least until Friday. The GC is essentially unchanged, although Jakob Piil lost 12 seconds on the uphill finish, as did Gilberto Simoni and Laurent Dufaux. Richard Virenque pulled off a trademark long breakaway on the Tour's first truly mountainous stage, and took a stage win in Saint Flours. It was Virenque's 7th career stage win, and by taking 1st place in each of the 9 king of the mountain contests today, he moves into the lead for the polka-dot jersey, which he's won 6 times. Like Lance Armstrong, Virenque is looking to set a new career record this year, by becoming the first 7-time King of the Mountains. Virenque's 200-km breakaway, first in a group of 18, then with Axel Merckx, and finally alone, is one of the longest in Tour history. I'll be wearing my polka-dot jersey pin today -- that was a hell of a ride. After 5:19, the peloton approached the finish. On the finish line, T-Mobile's Andreas Kloden led in Erik Zabel, who will score some green jersey points, then Francisco Mancebo, yellow jersey Thomas Voeckler, then Lance Armstrong, right among the leaders. Iban Mayo, Ivan Basso, Carlos Sastre, and Jan Ullrich were a few meters back, but in the same time. Tyler Hamilton and Levi Leipheimer were caught behind a gap on the finish, and lost 7 seconds in the overall, but that's no big deal. Virenque moves into 4th overall, and some of the flatlanders are starting to move down the GC. About half the peloton came in 24:24 back of Virenque. Au revoir, Magnus! Another tragic breakaway, as two riders who were away for about 80 miles were just nipped by the sprinters with less than 200 meters to race. I hate to tell Jens Voigt "I told you so", but it's Robbie McEwen (as I predicted overnight) taking the stage. The Tour site reports Inigo Landaluze and Filippo Simeoni were caught in the last 50 meters, while VeloNews says it was "less than 10 meters from the line...!!!" 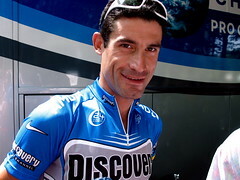 Landaluze's breakaway partner, Domina Vacanze's Filippo Simeoni, finished in 17th on the day. No effect on the overall leaderboard, except that O'Grady takes a time bonus to move within 3 minutes of Thomas Voeckler, who will wear the yellow jersey on Bastille Day in the longest stage of this year's Tour. Norway's Thor Hushovd of Credit Agricole took Stage 8 of the 2004 Tour de France with a beautifully timed sprint. No effect on GC, so Thomas Voeckler holds the yellow jersey at least through the rest day. Robbie McEwen moves back into the green jersey. McEwen hooked up with Paolo Bettini, who wanted to take a shot at the stage win with 600 meters to ride. Bettini realized that would set up a sprint he couldn't win, and deny his teammate Tom Boonen a place in the field sprint, so he quickly dropped back into the field. But he wasn't happy about it, and a few Italian hand gestures ensued. "But I'm not fooling myself. I know I'm not a threat for the big guys on this race; I'm not at their level. When the race hits the hills, it's going to be tough. But believe me, I won't throw in the towel. I'll gut it out in this jersey as long as I possibly can." Voeckler is riding in his 4th professional season. Given the number of riders nearing the end of their Tour years (Armstrong, Ullrich, Hamilton, Julich, Virenque, Zabel, O'Grady, and McEwen are all between 30 and 34), this year's white jersey competition and a few riders who have competed for it in the last few years takes on extra significance. Yellow jersey Voeckler, today's sprint winner Tom Boonen, yesterday's breakaway Sandy Casar, prologue winner Fabian Cancellara, and this year's Giro d'Italia winner, Damiano Cunego, who's sitting at home, are all under 25 and look likely to play a key role in Tours over the next decade. Samuel Abt provides his usual excellent coverage of the stage. He talks with Swiss-American Sven Montgomery, riding for Gerolsteiner, about the effects the weather continues to have on this year's Tour, and about Montgomery's goal: to ride into Paris. Only Voeckler among the five can be considered dangerous to Armstrong's hopes of winning a sixth successive Tour. The Frenchman, unlike his fellow fugitives, is a strong climber and won a strenuous mountain stage in the Route du Sud race in France last month. If he holds his lead, nine minutes can be a big cushion into the climbs in the Massif Central on Wednesday and in the Pyrénées on July 16. The first successful breakaway (take that, Al Trautwig!) of this year's Tour de France puts a Frenchman in yellow, as Thomas Voeckler of Brioches la Boulangere puts on the maillot jaune. Australia's Stuart O'Grady of Cofidis showed great road smarts, matching a series of attacks from Voeckler, then sprinting off the wheel of Magnus Backstedt from a long way out. The field came in about 12 minutes back. Robbie McEwen is likely to keep his green jersey, winning the field sprint for 6th place sprint points. Voeckler will hold the white jersey, but it will continue to be worn by Matthias Kessler. Full results are up over at RoadCycling.com. French national champion Voeckler looks likely to take the yellow jersey tonight, and O'Grady has taken a couple of intermediate sprints; given a bonus at the finish, he's made a great start in his announced goal of the green jersey. It's a major turnaround for the French, who had little success in last year's Tour until Jean-Patrick Nazon took the last stage. We could have a French yellow jersey, and a rider from a French team (O'Grady) take the stage today. Heck, Voeckler could do both; he's launched several sharp attacks to try to break from the group. There have been a few crashes today, including Manuel Beltran and Jose-Luis Rubiera from US Postal, who went down with Alessandro Petacchi, Roberto Heras, and others. Beltran and Rubiera needed medical assistance.